Below are our picks for the best modern designed and decorated bed & breakfasts and Inns from Texas to California. Kimber Modern Bed and Breakfast - Austin, TX – The KimberModern Discover a new way to stay. There are places you go. And then there are those indescribably alluring spots that draw you in at first glimpse. For the independent urban traveler seeking a unique escape, the KimberModern holds particular appeal. Perhaps it’s the clean lines of this architectural work of art tucked away within the vibrant SoCo district. 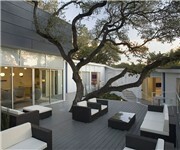 Maybe it’s the abundant light filtered through the canopy of oaks in the artfully landscaped Courtyard. Or it could be the absolute comfort and attention to detail found in each thoughtfully designed and technologically sophisticated room in this breathtaking boutique hotel. By taking the KimberModern to both architectural and autonomous extremes we were able to realize our vision of creating a place for guests who long to stay somewhere that’s unlike anywhere they’ve ever been. It’s simply a functional, comfortable and beautiful work of art.” The KimberModern offers a unique experience for the independent urban traveler – high-tech luxury in an intimate setting that allows you to define your stay on your terms not ours. While we’ve thoughtfully considered your every need, we leave it to you to fulfill those needs with amenities and necessities conveniently found throughout the hotel. 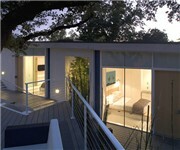 Modern B&B - Houston, TX – The Modern B&B is located in the Montrose area of Houston, Texas, less than one mile from The Menil Collection art museum. The University of St. Thomas is one mile away and Rice University is two-and-one-half miles from the bed and breakfast. 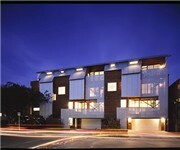 This four-story, steel, wood and glass building was designed by the award-winning Collins Architects. The interior of the bed and breakfast reflects the modern design of the exterior, with stained wood beams, a steel fireplace, clerestory windows, elevator and shaded verandas with panoramic views above the tree line. The walls are covered in contemporary artwork. Full, organic complimentary breakfasts, featuring homemade streusel coffee cake, caramel pecan rolls, 10-grain waffles and fruit smoothies, are served daily. 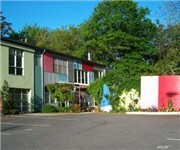 A conference room, fax services, computer and complimentary wireless Internet access are available. Houston Modern Luxury Magazine raves about it being warm modern (July 2006). Where to stay for chic affordability, says Essence Magazine (May 2006). 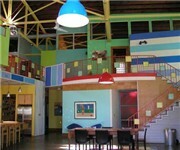 One of 16 Hip Hotels in America as rated by Dwell Magazine (Oct 2005)! Gaige House, a Joie De Vivre Boutique Hotel - Glen Ellen, CA – A best kept secret among Sonoma Valley hotels and Napa Valley hotels, the Gaige House features Asian-inspired ambiance combined with modern luxury. Gaige House is an exceptional blend of vintage and contemporary. Nestled along peaceful winding roads and flourishing greenery, the Gaige House is renowned for its picturesque setting, impeccable service, and unique luxury Sonoma hotel guest amenities. 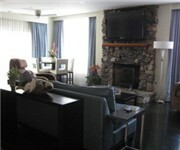 Relax and experience the Gaige House’s secluded sprawling gardens, spa services, heated swimming pool and hot tub. Sway effortlessly on a hammock under a large shady tree while Calabazas Creek lulls you in and out of consciousness; Pure, serene relaxation. A variety of sanctuaries exist on the three lush acres, ranging from thoughtful foliage-lined pathways along Calabazas Creek to private suites reflecting Zen-inspired design. Ten luxurious guestrooms are in the main house and a 2005 redesign and expansion offers 13 stand-alone, distinctive Gaige House spa suites. Each suite features unique amenities and an interior designed by the renowned New York designer Paul Davis. The Aurora Hotel Bed and Breakfast - Avalon, CA – Inspired by the sea, Aurora immerses you in relaxation, inviting you to discover the magic of sensuous waves and the comfort of modern style. Your Catalina hotel will be the cornerstone of your Catalina Island vacation. 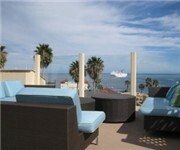 Avalon's newest inn combines Catalina bed and breakfast hospitality with a metropolitan boutique hotel ambiance. Step away from ordinary Catalina Island lodging and into the ultra-modern environs of Aurora. With a crisp, modern design, the Aurora Hotel provides Catalina's overnight guests with a sleek haven of relaxation and style. Its sophisticated, contemporary look is unprecedented on the island and inspires the spirit with a palette reflecting the beauty of Southern California's natural wonders. Aurora offers her guests a new level of island hospitality. As soon as you walk through the door you will be surrounded by a modern ambiance characterized by a cosmopolitan lobby with stylish couches for relaxing and an artistic, modern feel. Urban Oasis Bed and Breakfast - Atlanta, GA – The Urban Oasis at 130 A Krog Street is a 5,400 sq foot loft located in the Inman Park neighborhood, just one mile from Downtown Atlanta. We provide our guests at the Urban Oasis Bed and Breakfast with a different way to experience modern southern living in a loft right in the middle of this hip, vibrant city. This 5 bedroom 4 bath loft has been featured in magazines and on television and has been the site of many photo shoots for print and TV. The proprietors Judi Knight and Duane Solem love to entertain and you will feel like a guest in their home. It is a perfect way to experience the city and to feel like you are visiting friends in town.